Many start up … but few scale up. Despite the fact that more than 11,000 business start every hour around the globe, many never scale. To scale, leaders need to get the People, Strategy, Execution, and Cash aspects of the company right and into alignment with each other. Scaling large firms is even more challenging. Yet, the same techniques and tools taught to high-potential scale-ups are the same as for the Fortune 500. Here are four ideas that will help you scale, drawn from strategies that have powered many of the most successful firms in their respective niches. Even for minor initiatives, don’t make decisions alone. Right now, take out a piece of paper and make a list of the top 25 people/influencers who can help you more rapidly scale your business. Some might be informal influencers within the company whose buy-in you’ll need, such as frontline employees or board members. Others will be external – high visibility clients, media personalities, thought leaders, or other influential people. When I advised a company in the carbon credit space, #1 on its list was Al Gore, for instance. Then start working the list. Look for ways to meet them in person or ideally, break bread with them. Mark Zuckerberg has been wise to spend time with China’s President Xi Jinping. When you approach influencers on your list, look for ways to assist them. Your success is the sum of the people you get to help. Who are your top 25? Once you’ve identified the fundamental constraint you plan to fix, align every tactical and strategic decision to support this strategy and boil it down to one phrase. What is your one-phrase strategy? Communication is the #1 challenge, whenever you have more than one person on a team. Ask anyone who is in a relationship! At the heart of what we call the Rockefeller Habits is a quick daily huddle – a five- to 15-minute touch point eliminating the need for countless emails and side conversations among team members. Ever tried solving a problem via email? It will take months vs. minutes unless you get everyone together for a quick discussion. No successful leader in Silicon Valley would think to produce robust software without a daily gathering – a technique at the heart of scrum/agile methodologies. It’s the same technique that will power all your activities. If you want to scale faster, pulse faster. When will you start your daily huddle? Find ways to get your customers to fuel your scale-up – whether by requiring bigger upfront payments or dramatically increasing the speed of your sales and delivery cycles. The title of Professor John Mullins’ book The Customer-Funded Business sums up my view on what should be the primary source of growth capital. Costco collects enough cash from memberships to continue to fuel its growth. When Elon Musk needed $4 billion to build a factory, he received an interest and equity free loan from 400,000 customers who put down $1,000 deposits. And Amazon has survived a decade of unprofitability (now reversed) from selling Prime memberships. How will you get customers to fund your growth? These are just four of many ideas, tools, and techniques shared in Scaling Up. Keep scaling! 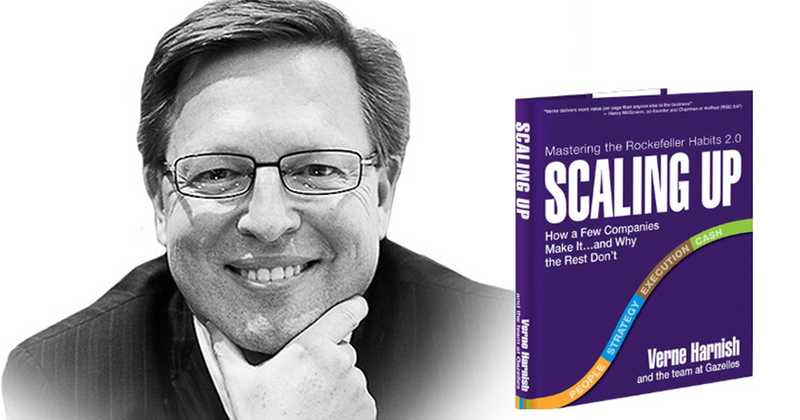 Verne Harnish is the author of Scaling up and Mastering the Rockefeller Habits. He leads Gazelles, an international coaching firm, and writes for Fortune.